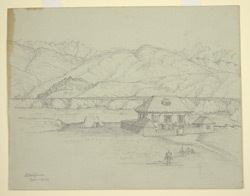 Pencil drawing of the Residency Bungalow at Bhaktapur in Nepal, by Henry Ambrose Oldfield (1822-1871), dated December 1863. The image is inscribed on the original mount: 'The Residency Bungalow at Bhatgaon. December 1863'. On the reverse is an unfinished drawing of a bridge. Bhaktapur, the 'City of Devotees' is 11 km east of Kathmandu and 10 km north-east of Patan and is the youngest of the three former city-states of the Kathmandu Valley. Bhaktapur was founded in the 9th century and rose to prominence under the Malla dynasty. It remained a valley kingdom until the late 15th century when it became a sovereign state, together with Kathmandu and Patan. At the end of the Anglo-Nepal War (1814-1816), by means of the Treaty of Segauli imposed on the Gurkhas who ruled the Kathmandu Valley, Nepal had to accept its present eastern and western boundaries and admit an official British Resident in Kathmandu. Dr Oldfield was Residency Surgeon at Kathmandu from 1850-1863. After his death his family published his two volume 'Sketches from Nipal, Historical and Descriptive...' (1880), which described life at the court of the Maharajah Jung Bahadur, together with descriptions of religious monuments and architecture, illustrated from Oldfield's own drawings.